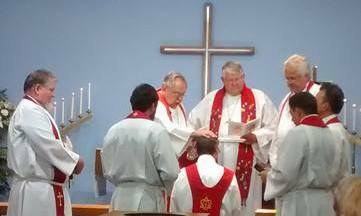 On Sunday, October 2, 2016, the members of Ascension in Daphne, AL, celebrated the installation of their new pastor, Rev. Ralph Hough. Participating in the service were Rev. Marvin Mueller, Officiant; Rev. Ed Brashier, Preacher; District President Kurtis Schultz, Installer; and Elder Mike Shulz, Lector. Clergy from Circuit 11 participated in the Rite of Installation. Pastor Hough and his wife, Sarah, have come to Daphne from Canton, OH. They are the parents of four adult daughters and the grandparents of five grandchildren. The family was welcomed by a congregational barbecue after the service.